For many, myself included, the holidays are more than just stressful. They can be downright depressing. The key for me all these years, decades if you will, is that I always believe the next year will hold better for me. My dislike of celebrating holidays goes well beyond the year I was diagnosed with cancer, although that holiday season definitely did not leave me feeling jolly. But there have been more than a handful of serious events and tragedies around the yuletide time of year. To be honest, I do not really dwell on it. I move on from one year to the next. I will say that I put a lot more effort into at least faking it, once my daughters came into my life. Okay, perhaps “faking” is a bit strong. I did enjoy seeing the innocence of the holiday return through my daughters’ eyes. 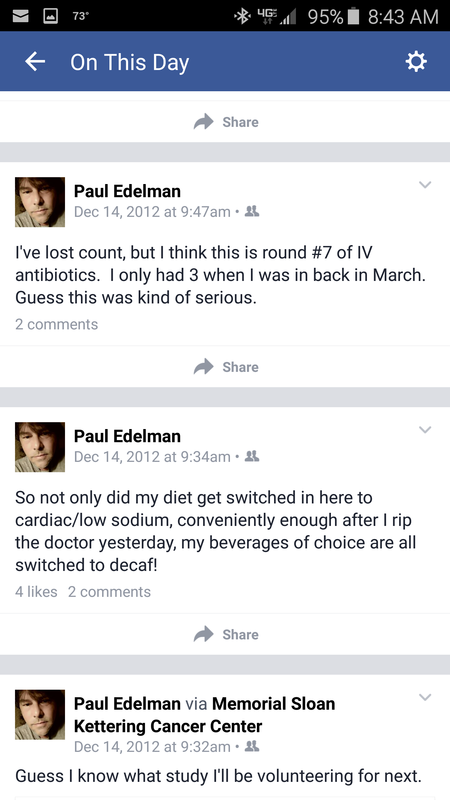 As I mentioned, and have listed elsewhere on “Paul’s Heart”, a lot seems to happen during this time of year. A recent “memory” that popped up on Facebook reminded me of one such recent event. Like I said, I have the ability to block out the events that happen during this time of year, as I did with this particular incident. I was put into the hospital, in serious condition with my second bout of pneumonia in just 9 months. This is one of those “gifts” that I have received from treatments for my Hodgkin’s way back when, resulting in a lowered immune system. My earlier case I was actually diagnosed septic. This particular time, I had it in both of my lungs. In December, it is not only the month of Christmas, but in less than a week, I should be celebrating another birthday that I thought I would never see. My stay in the hospital was longer than the earlier battle, and it took a lot more meds to get this under control. But I did make it home for my birthday, and for Christmas. I want to be perfectly clear. I do not take each holiday season for granted. I am part of a large society of long term cancer survivors who battle long term side effects and deal with these issues every year. I have also said good bye to so many. But there are so many, that will be heading into this holiday, either facing a serious illness, or worse, having lost a loved one. And as all of us will tell you, it is not easy getting through this holiday as it is, especially this holiday because it was a holiday that was shared. For those of you dealing with a new crisis, or having suffered a loss, I keep a place in my heart, and special thoughts in my mind for comfort for each and every one of you.